Virginia Leith (born October 15, 1932) is an American film and television actress. Leith starred in a few films, with her most productive period coming in the 1950s. Her debut in 1953 was also the first film directed by Stanley Kubrick, a self-financed art house film, Fear and Desire. She signed a contract with 20th Century-Fox in 1954 and had leading roles in films such as On the Threshold of Space, Toward the Unknown, Violent Saturday and opposite Robert Wagner and Joanne Woodward in the crime drama A Kiss Before Dying. She left show business following her 1960 marriage to actor Donald Harron. After her divorce from Harron, in the 1970s Leith resumed her career and appeared in a few films and on television shows, including Starsky and Hutch, Barnaby Jones, and Baretta. She left the screen again in the early 1980s. 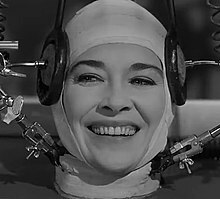 Her most recognizable role may have been that of a decapitated woman whose head is kept alive in The Brain that Wouldn't Die. She was involved with actor Jeffrey Hunter during his divorce in 1955. She dated actor Marlon Brando in 1956. ^ "A Silent Virginia is Discovered". Life. May 11, 1953. p. 122. ISSN 0024-3019. ^ "Virginia Leith Biography". Brian's Drive-In Theater. Retrieved March 27, 2018. ^ "Virginia Leith Profile". Glamour Girls of the Silver Screen. Retrieved March 27, 2018. Wikimedia Commons has media related to Virginia Leith. This page was last edited on 12 November 2018, at 08:51 (UTC).